This series of monoprints is a visual exploration of the interconnectedness of designer and printmaker Bradley Coulter’s research into the history of letterform design, the psychology of reading, and machine languages. By returning to the hand to explore the calligraphic history of letter-forms—and to push them into emotive as opposed to pure-ly communicative ends—Coulter’s work is both an effort to interrogate the past and ponder the future modes of written communication, both human and otherwise. These prints combine digital design, hand mark making, and chance with the fine art lithographic process, and draw their inspiration from the design—and design process—of Coulter’s Sabine Antiqua typeface. 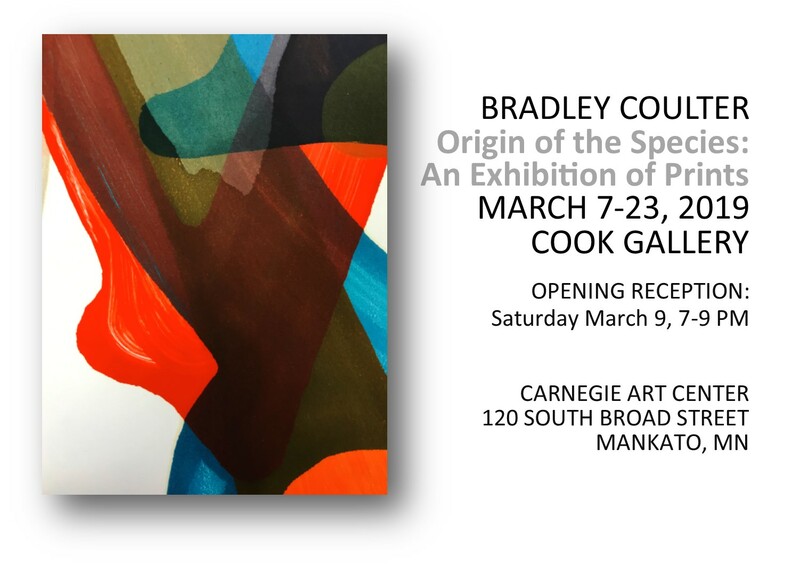 Educated in Illinois and Japan, Bradley Coulter worked as a graphic designer, fine press printer, and design educator in Seattle, Washington for 10 years before returning to the Midwest to pursue graduate studies, receiving MA and MFA degrees in Design from the University of Iowa. He is currently an Associate Professor of Graphic Design and Typography at Minnesota State University, Mankato. He has presented on type history, type design, and the intersection of typography and literary theory, served as an editor for respected journals, and shown his design work in juried exhibitions across the U.S. His research is focused on exploring the psychological components of type design and use, and integrating those findings into a cognitive application of type to the page and the screen.